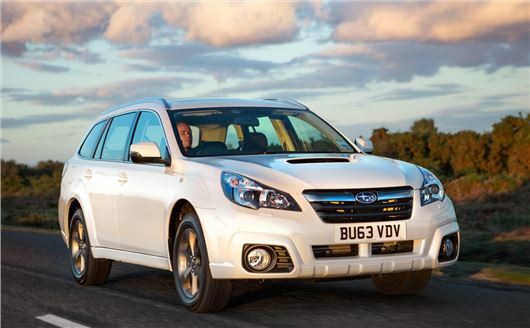 Subaru has revised the Outback, with the addition of a new, more generously equipped SX trim level and more importantly a Lineartronic CVT automatic gearbox linked to a 2.0-litre diesel Boxer engine. All models feature all-wheel drive for use in poor weather or in off-road environments. The new SX trim level comes with 17-inch gunmetal alloy wheels, electrically folding door mirrors, roof rails, sunroof, HID headlights, automatic wipers and lights, cruise control, heated sports seats, USB and Bluetooth connectivity and reversing camera. Leather upholstery and sat nav are optional. The 2.0D engine produces 150PS and 350Nm of torque regardless of the transmission specified. Unfortunately emissions aren’t particularly competitive at 155g/km for the manual or 166g/km for the automatic, which equates to 42.3mpg or 39.5mpg on the combined cycle, respectively. We’ll be road testing the updated Outback early next week so stay tuned for a verdict. I've waited 5 years for an auto Outback times have changed - this spec is £5k overpriced, for the UK. May still test drive but need to travel 60 miles to nearest dealership, then consider against used CX5. £32K almost - very pricey - leather and satnav extra! The reason it seems 20% overpriced is because of VAT. When comparing UK prices to others around the world people forget that every car on sale here is automatically one fifth more costly - and this is before taking key foreign market differences into account (there is no diesel in the US range, there are no CO2 pinch points, BIK, etc.) and buyer expectations. Americans are still obsessed with large petrol engines and low rate finance so that's what manufs. have to offer to compete. Not to mention how restricted the Subaru range seems these days from a European standpoint - emissions regs that mean all the 'interesting' aka thirsty models are no longer sold here. US Price equates to £21,000 for a top spec car - admittedly not diesel but it has a big petrol engine with a TC gearbox + a lot more bells & whistles for the money. Subaru BRZ is priced equal to Toyota GT86 as they are the same car with different badges.........if it weren't for the Toyota version I am sure IM Group would have stuck another £3,000 on the ticket. The same spec OB Diesel inc CVT = £28.4k inc taxes in Perth Australia, the main selling point being 1000kms on 1 tank of fuel.